Les cascades d'Ouzoud sont l'une des merveilles naturelles les plus photographiées du Maroc, cachées dans les montagnes du Moyen Atlas. Découvrez-les lors de cette excursion d'une journée complète au départ de Marrakech, en bénéficiant de la petite taille du groupe. Voyagez dans l'Atlas, en passant par des villages traditionnels et des points de vue sur la faune, admirez des vues spectaculaires sur les cascades de 360 pieds (110 mètres), puis déjeunez (à vos frais) au-dessus des magnifiques chutes. The guide is not optional and you get to know it's approx €5 (rather than €3) right before going back Marrakesh. The waterfalls are worthy and deserve a one day trip. However, the driver leaves you on the road in the middle of nowhere far apart from the waterfalls (you can't see them) and introduces you to someone who will show them to you. You have no option, but to follow him, and no price is mentioned at any point. Even if you want to make it on your own, only the guide knows how to make it to the meeting point. Right before going back to Marrakesh, you are requested to pay 50 dirhams pp. (approx 5€). Neither the driver nor the guide accept any liability for the description enclosed in the ticket you get from Viator or their website. A long drive, but worth it! The driver was pleasant, the guide we met at Ouzoud was simply amazing! The recommendation on this purchase was a tip of 3 Euros per person, our guide was worth substantially more! He was very informative and attentive. Our group had people who spoke French, Spanish and English. He manged to give us all personal attention and explain everything in our language. Bit of advice, walk with cash no credit cards and you will need coins to pay to use the toilets. the driver didnt speak English and when you get at the waterfall a local guide approach you and starts to take you around but to be honest there is no need for it...you can do it yourself for free. the guide forced us to have lunch to a specific restaurant more expensive than others but we decided to chose a different one and he got quiet upset about it and we didnt want to pay him as we didnt required his service and we got rushed through the all things. overall i suggest to get there, visit your own no guide as it is easy to follow the path in the forest and have lunch where you feel like it. The tour here is only for the bus - you will be paying the tour guide at the falls 35 dirhams and he will give you a fabulous tour but there is no point paying the extra on here as you don't get anything but a mini bus taxi provided anyway! The highlight of our trip! Would absolutely recommend doing whilst visiting Marrakech. 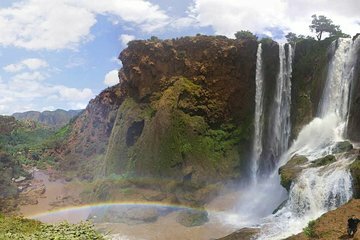 Ouzoud Waterfalls was beautiful! I would definitely recommend! The description said a tour guide once there was optional however once there a guide showed us all around and then expected us to pay. It wasn't expensive but we weren't given the option. He was very knowledgable so that made up for it! We were picked up at our home at around 8AM by a driver that drove us to a location where we met a larger group total of 15 people. The mini-van was comfortable, somewhat spacious and the air conditioning was efficient it was a very hot day. The trip to the Ouzoud waterfalls took around 3 hours, but we made a small stop along the way for bathroom and eating there was a small shop. When we arrived at the Ouzoud waterfalls, we were introduced to a local guide that offered his service to the group the asking price was 35 dirham per person. He took us off the beaten track and told us some jokes. The first stop was halfway to the bottom of the falls. It was a small cafe with a panoramic view of the waterfalls drinks were 10 dirham each. We were there maybe for 30 minutes and there was time and room to change to our swimming clothes. After that, we were guided to the waterfall itself. There, we took a small boat ride 20 dirham per person and got really close to the waterfall. It was wonderful! We also had time to swim before lunch. The restaurant was already set up by the guide and the menu included entries, tagine or skewers with chips, mint tea and seasonal fruit 100 dirham per person, plus tip. Afterwards, we climbed our way up through the main path and we had a close and brief encounter with the monkeys we could have some peanuts for the monkeys and even get a photo with them. We were picked by the same mini-van at around 3.30PM. We were dropped off in a square near our pick-up point around 6PM. All in all, it was a wonderful day! Beware that this is basically a transport service - the tour itself, the drinks, the lunch and the boat trip were not included. If you are in a budget trip, we recommend this tour!